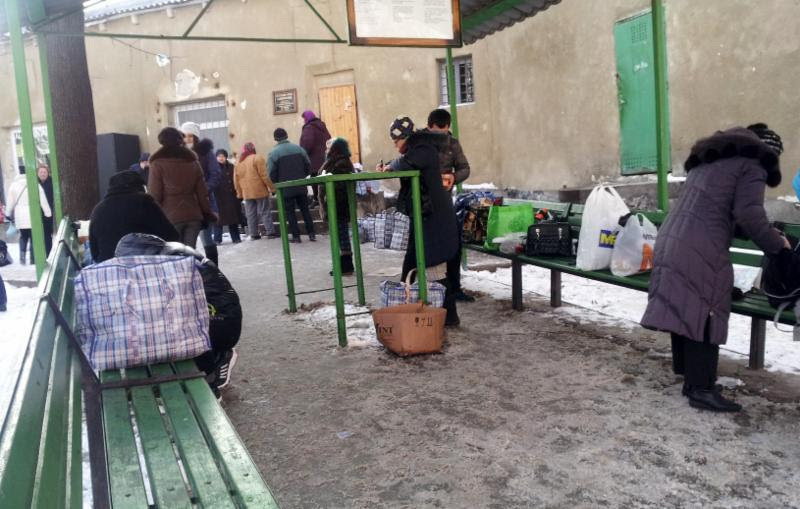 Family members wait for hours outside the prison in Moldova to bring food to their loved ones behind bars. Chișinău/Moldova, 21.01.2016 (HRWF) – On 26th January, there will be a new court hearing about whether or not the pre-trial detention of Mihai Calestru and Oleg Savencov will be extended. The two men are members of the Unification Church who were arrested on false charges (human trafficking) on 30th October 2015. On Tuesday, representatives of Human Rights Without Frontiers Int’l (HRWF) and Forum on Religious Freedom/ Europe (FOREF) held a press conference in Chisinau and asked Oleg Savencov and Mihai Calestru to be “immediately and unconditionally released.” A representative of the local branch of Amnesty International, who was also a former prosecutor in Moldova, commented on the case during the press conference and confirmed that it was unfounded. The Prosecutor’s allegation against the two men is deeply flawed. It claims that they established the Unification Church in Moldova in 2008 as an “organized criminal group.” One of the defendants, Oleg Savencov, is a Ukrainian citizen who entered Moldova only in 2014. Mihai Calestru was never a Church leader. “Moldova’s anti-trafficking legislation was not meant to be instrumentalized against peaceful religious organizations,” said Dr Aaron Rhodes, President of the Forum for Religious Freedom-Europe. If convicted of trafficking under Article 165, Oleg Savencov and Mihai Calestru face jail terms of 6 to 12 years. Last year, the movement of Falun Gong was banned by a court on the basis of a law against extremism that is now reviewed by the Constitutional Court of Moldova. Savencov and Calestru must be released immediately and unconditionally! Press Conference by HRWF Int’l and FOREF Europe in Chisenau, Moldova (January 19, 2016). Click on Image to see video recording. Chișinău/Moldova, 19.01.2016 (HRWF) – Oleg Savencov and Mihai Calestru, two members of the Unification Church who are in pre-trial detention in Moldova charged with trafficking in human beings, should be “immediately and unconditionally released,” according to Human Rights Without Frontiers and the Forum for Religious Freedom- Europe, two international human rights organizations that have investigated the charges. This entry was posted in Uncategorized and tagged Human Trafficking, Moldova, Religious Freedom, Unification Church. Bookmark the permalink.